Irvine, CA – Dr. Ali Sepehr is a board-certified Orange County facial plastic surgeon committed to delivering rejuvenated, natural-looking results for his patients. At The OC Center for Facial Plastic Surgery, his private practice, Dr. Sepehr offers procedures both surgical and nonsurgical year-round. 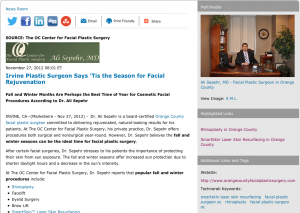 However, Dr. Sepehr believes the fall and winter seasons can be the ideal time for facial plastic surgery. After certain facial surgeries, Dr. Sepehr stresses to his patients the importance of protecting their skin from sun exposure. The fall and winter seasons offer increased sun protection due to shorter daylight hours and a decrease in the sun’s intensity. In addition to the benefit of decreased sun exposure, some patients use holiday vacation time as an opportunity for postoperative recovery and rest. Dr. Sepehr also notes that many patients come into the office right before the holidays for BOTOX® injections and dermal fillers to prepare for the holiday party season. While Dr. Sepehr encourages his Orange County facial plastic surgery patients to take into account the timing of their surgery, he also stresses the importance of choosing a well-trained, board-certified plastic surgeon. When possible, he suggests seeking a surgeon who is specifically trained in facial plastic surgery to ensure the patient receives the highest quality of care. Dr. Ali Sepehr is a board-certified facial plastic surgeon and earned his medical degree from the University of California, Los Angeles School of Medicine. He is one of a few select fellowship-trained facial plastic surgeons and completed his Fellowship in Facial Plastic and Reconstructive Surgery in Toronto with world-renowned facial plastic surgeon Peter Adamson, MD. Dr. Sepehr has taught fellow surgeons on the techniques of facial plastic surgery. He is a Diplomat of the National Board of Medical Examiners, a member of the American Academy of Facial Plastic and Reconstructive Surgery, and a member of Alpha Omega Alpha Medical Honor Society. Dr. Sepehr has authored numerous chapters in textbooks and scientific papers in various facial plastic surgery journals, and outside of his private practice he continues to actively teach fellows, residents, and medical students from University of California, Irvine Medical Center. In 2010, he received the Reuther Kris Conrad Merit Award for outstanding achievements in the field of research and perseverance in attaining the highest level of expertise in the performance of Facial Plastic Surgery. Dr. Sepehr is available for interviews upon request.